Ultimate Airliners – Super 80 Professional is Released! Flight One Software and CoolSky are excited to announce the release of Ultimate Airliners – The Super 80 Professional… a highly advanced new addon product for MS Flight Simulator X. Ultimate Airliners – The Super 80 Professional is a complete aircraft and panel package which simulates the McDonnell Douglas MD-80 in absolutely amazing detail. All systems in the aircraft are simulated with a very high level of accuracy to make the experience as complete as possible. This package simulates the latest Electronic Flight Deck (EFD) cockpit upgrade given to the MD-80 series. It includes a full EFIS with FMS, TCAS, Systems Display Panel, Engine Display Panel, and many more advanced systems. Real MD-80 pilots will feel right at home and beginners will be able to completely learn the cockpit due to the interactive Integrated Cockpit Training System. The external model and Virtual Cockpit are fully featured, all designed in 3DSMax and are fully FSX/DX10 compliant. A full sound suite is also included with many audible cockpit sounds. 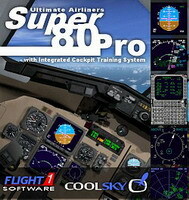 The Super 80 Professional features the ground breaking Integrated Cockpit Training System (ICTS). The ICTS is an interactive, in-flight training system designed to teach you how to operate the aircraft while in the cockpit, and it covers all stages of flight beginning from cold and dark. This means that the process of learning to fly a new aircraft in MSFS has been totally reinvented with the ICTS. 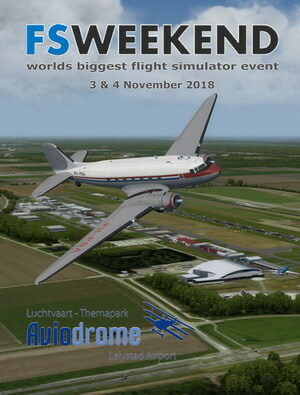 Whether you are a first time or seasoned simmer, jump straight into the cockpit and start flying now! The Training Center itself is the starting point for all interactive training. You will find training guides for the checklists, various procedures/operations, EFIS, FMS, and other complex cockpit systems. The Super 80 Professional also features the Automatic Aircraft Configuration (AAC) system. The AAC system will automatically setup the aircraft and all systems, for the selected phase of flight, at the click of a button. The package is shipped with many high quality liveries. In addition to the default liveries, there are additional liveries by McPhat Studios featuring various operators from around the world. McPhat Studios specializes in creating weathered and worn looking aircraft with extremely high attention to detail. You can get the product today at http://www.flight1.com/products.asp?product=uas80pro or by visiting CoolSky at http://www.coolsky.no/super80pro/super80pro.htm. There is also a limited time discount if you are a previous Flight1/CoolSky customer of the classic Super 80. Information on the discount can be viewed on the main Flight1 Super 80 Professional product page.